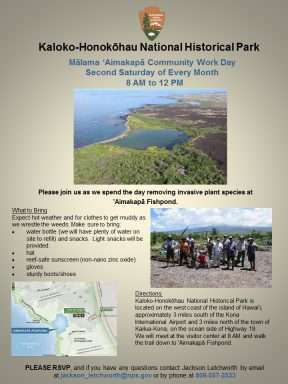 Fishpond Workday at Haleolono Every Second Saturday of the Month! 9:00 am - 12:00 pm Nā Kuleana Rock wall restoration Halihali pōhaku Dry Stack Debris clean up Land maintenance Must have: Work clothes, swimwear. Water bottle, tabis. Gloves (optional). RSVP via Instagram: @edithkanakaole.foundation or @hale_o_lono or FACEBOOK.